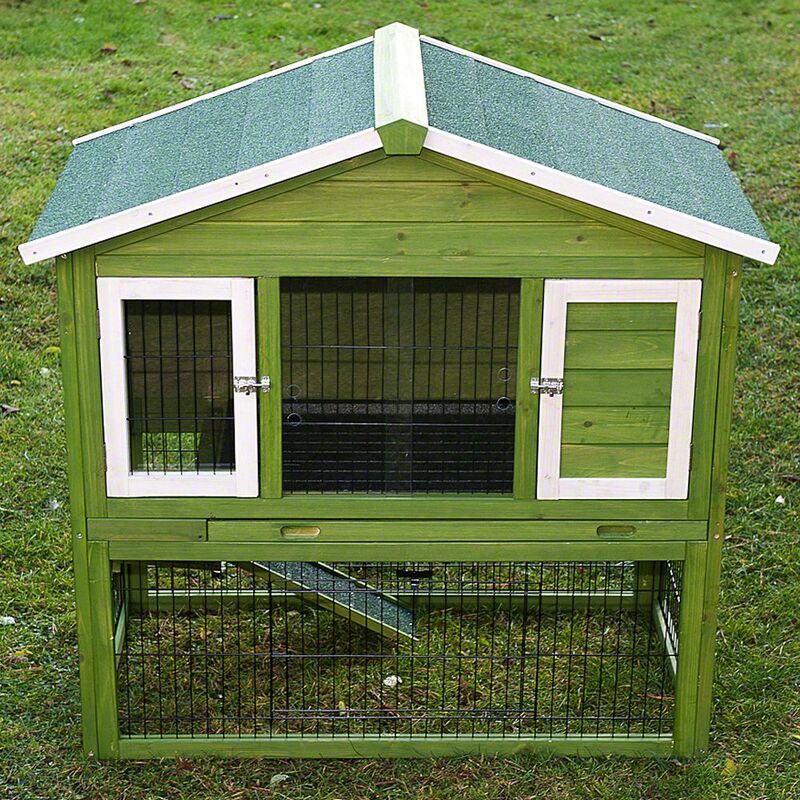 A great rabbit hutch with integrated run. See below for the best deal on Outback All-Seasons Rabbit Hutch with Run. Big Savings on Outback All-Seasons Rabbit Hutch with Run! A great rabbit hutch with integrated run. The sleeping area is well insulated so you can leave your pet outside, no matter what the weather. And the integrated run lets your pet get a breath of fresh air whenever it wants to. The hutch area is insulated on all four sides with polystyrene. And there are plastic sheets included which can be placed in front of the mesh to keep the elements out. By sliding in the plastic sheets, the hutch/run can be extra protected from wind and rain, The middle mesh window with 2 panes of sliding plexiglass. There are two doors for easy access on the front of the hutch and the pull-out base tray makes it easy to clean. The roof can be opened on both sides. There is a partition which forms storage space where you can keep everything you need to look after your pet or you can fill it with straw for added insulation. This partition has a triple hatch so it can also be opened up for easy access to the hutch. The ramp leading down to the integrated run can also be closed off, so you can prevent your pet from going outside when it is too cold. A large mesh door on the front of the enclosure provides easy access to the run. The Outback All-Seasons Rabbit Hutch with Run at a glance: Total outer dimensions: 117 x 66 x 114.5 cm (L x W x H) Outer dimensions of hutch (without roof overhang): 107 x 58 x 45 cm (L x W x H) Exterior dimensions of hutch: 107 x 58 x 43 cm (L x W x H) Interior dimensions (with dividing wall): sleeping area 28 x 52 x 44 cm (L x W x H); the rest of the area 70 x 52 x 44 cm (L x W x H) Passage size to the sleeping area: 18.5 cm x 23.5 cm (W x H) Inside height of hutch: 41cm 2 hutch doors: each 25 x 38 cm (W x H) Mesh door in run: 39.5 x 24.5 cm (W x H) Bar spacing: 2.6cm Bar thickness: 3 x 2 mm (horizontal/vertical) Roof overhang: 4cm Pull-out plastic base tray Styrofoam-insulated walls (1.7cm thick) With plastic sheets Opening roof, covered with roofing felt Strong bolt latches Ramp with bitumen coating Made from glazed pinewood and powder-coated iron Weather and winter-proof For additional information regarding advised care, safety and liability, please read the attached "Hutch and Runs Information" * This product is shipped in more than one parcel. Parcels may arrive on different days. A great rabbit hutch with integrated run. The sleeping area is well insulated so you can leave your .. The Best Deals online for Outback All-Seasons Rabbit Hutch with Run and your essential Pet Supply Products. Order over £29 and get FREE DELIVERY on all orders today. Most orders are processed and dispatched within 24 hours from this supplier (zooplus) and their delivery service partners provide online parcel tracking facilities, active from 2-3 days after dispatch of your Outback All-Seasons Rabbit Hutch with Run order. The suplier 'zooplus' offers International shipping to the countries listed in the table below for shipping on Outback All-Seasons Rabbit Hutch with Run.